Gratitude is more than a mental exercise, more than a formula of words. We cannot be satisfied to make a mental note of things which God has done for us and then perfunctorily thank Him for favors received. To be grateful is to recognize the love of God in everything He has given us — and He has given us everything. Every breath we draw is a gift of His love, every moment of existence is grace, for it brings with us immense graces from Him. Gratitude therefore takes nothing for granted, is never unresponsive, is constantly awakening to new wonder, and to praise of the goodness of God. For the grateful person knows that God is good, not by hearsay but by experience. And that is what makes all the difference… Gratitude is therefore the heart of the Christian life. I’m reading a book on liturgy right now. Not sure what I’ll find. I like the “rest for your soul” concept. I’m at a cross roads in worship. I find myself hungry and tired. If I’d remembered in time, I would have made this my memory verse this month. Maybe I’ll save it for next month. For now I like the direction it gives. Ask (God) where the good way is. And then dear one – WALK IN IT. A needed word for now. What crossroads do you face today? Having Fun in Broken Arrow with Mission Ablaze! I apologize for my lack of posting, I’ve actually been sick. Still am. However. I did want to jump online and give you some highlights from church for the last few weeks. I hope you enjoy the pictures. 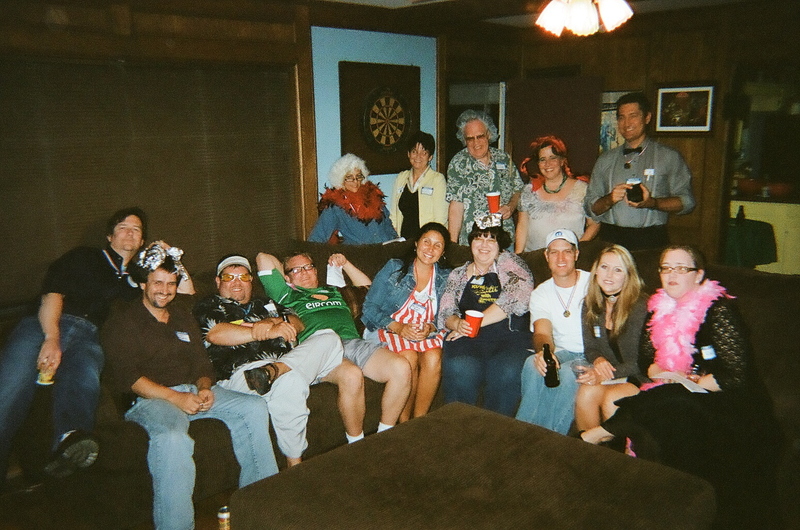 This is our crew from the Murder Mystery Night at my house. Planning nights like this are actually, very easy. All I did was go to MurderMystery.com and order a mystery package. Very simple. I cooked the main dish and everyone brought a side dish or drink to share and we had a blast. 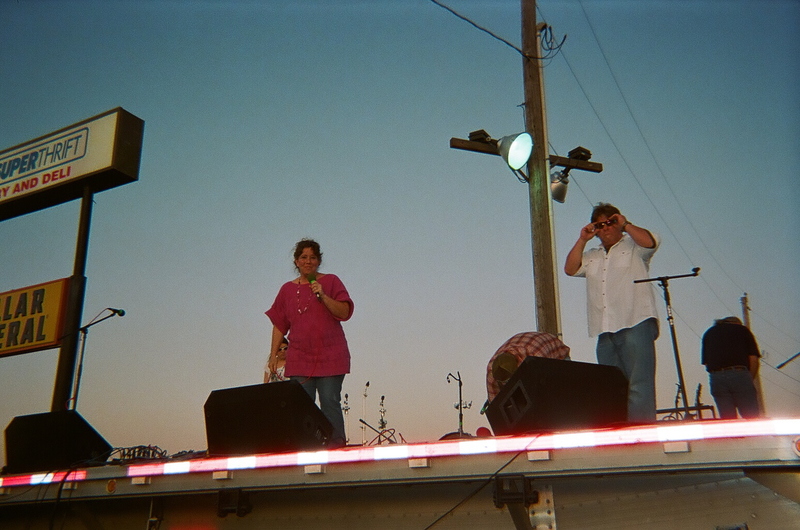 This isn’t the best photo, but is is me performing at an outdoor festival this fall called “Taking Jesus to the Streets.” in Manford OK. This was the first year they had a stand up comic. They have four different bands who play and I told jokes between set ups. Load of fun. And they asked me to come back next year. I always like that. Looking for a cure for “Terminal Seriousness?” — try hiring a Christian Comic for your next outreach event. Pictured here are Michele VanDusen, Dan McGowan, and myself. 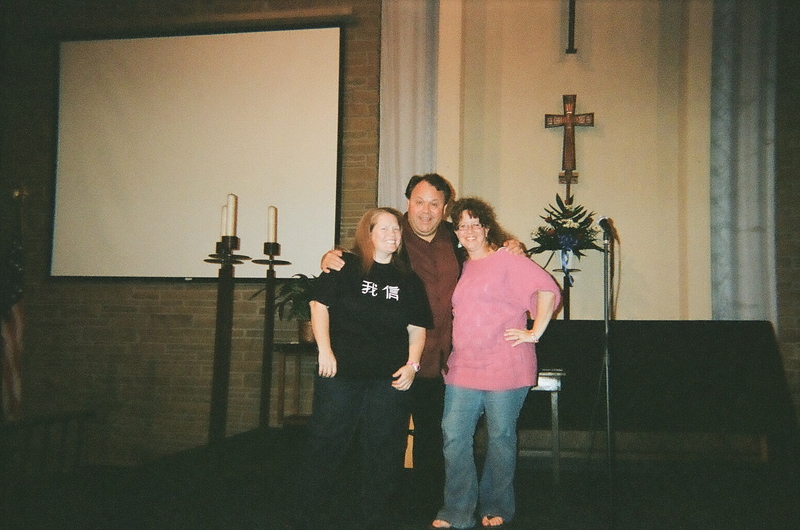 The three of us performed almost two hours of clean, family friendly comedy for the folks at Our Savior Lutheran Church in Tulsa OK. This proved to be a wonderful outreach event. Tickets were only $5 a piece to cover expenses and we had 80 people show up. 1/3 of them had never been to our church before. Comedy nights are a great outreach. We intentionally chose to host this event at Our Savior rather than Ablaze for a myriad of reasons, and you know, I think it turned out great. So well in fact that our board of evangelism wants to host more events like this. And that is us in a nutshell right now. Ablaze Church is still chugging along while we wait for the survey results. We worshipped over 50 people again last week and that is a good sign. Whether or not we keep Ablaze as a stand-alone mission start or a satellite has yet to be determined. In time, we’ll know. For now, we serve. I was talking with a friend of mine recently and you know, we serve an amazing God. This blog has taken many turns while I find my voice, and my place in His kingdom. I’ve always been a servant, it is the where I serve that has changed and grown. I’ve traveled from humorist, to bible teacher, to missionary of sorts, to comedy. My love for God and his word has not changed. I still first and formost want to be a Bible Teacher, in His plan though and not my own. He hasn’t closed that door, but I do know that there are things I still need to learn, work through, and overcome. Each direction is a place where he let’s me grow up into his next role. I just don’t know that that is yet. I love to teach, and can relate to small groups without a problem. I struggle with larger crowds and the minute you put a microphone in my face, I become an introvert. Learning stand up, has taken that fear away. It’s amazing to me to see God’s hand in all of this. He opened those doors, I didn’t. It is God who allows favor, not man. Will he keep me here? I don’t know. But I do know that He is smiling and that I make him laugh. And that is a good thing. If you are new to my blog, I should warn you, I’m a little strange. Fear is a major stronghold in my life and so I made a decision several years ago to find that one thing that scares me most and to keep doing it until I’m not afraid anymore. This is that one thing right now. Until next time. Trusting in him. The roads I travel in life are rarely smooth. Maybe it’s because I live in Oklahoma and we don’t believe in repairing concrete, or maybe it’s the wonderlust redhead in me, either way I start down one path and I inevitably wind up on some motorcross race track doing loops, turns, tricks and stops, pausing from time to time to eat mud pies. Being a humor writer and loaning out stories and jokes is a smooth road. Stand up comedy? Not so much. I don’t know this road and yet here I am, forsaking one for the other. I’m taking my shot and running with the big dogs. Why? Only my psychiatrist can answer that. It just feels right. That’s all there is to it. I have this insatiable need to make people laugh and to do it well. 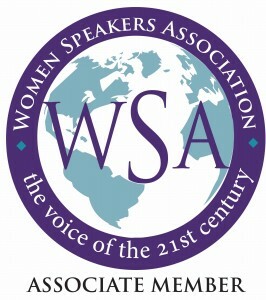 “Hi, I’m Deana and I’m a stand up comic.” My 12 step group meets in clubs throughout the United States. I can only blame myself for what happened next. I spent the next two years striving to save my pride and convince this dear sweet long on patience man that I am indeed funny. I went to no less than six of his shows hoping for another shot. We communicated via telephone, email, snail mail and in person. I even bought roughly ten of his paintings. Hey, it’s not stalking until you see the whites of the retraining order, okay? It turns out that I cannot get within a hundred yards of Yakov without turning into a walking labotomy. Go figure. Undeterrred by my egostically driven set back, I continue on as a humor writer and story teller. Joining writing groups and comedic message boards to better hone my craft, I learn that Christian comics have their own club of sorts. They have a message board, facebook, fan pages and conferences. Figuring that four years is enough time to hide from comics and that the stigma has to have worn off by now, I drive with a friend to their most recent conference in Nashville Tennessee. In all fairness, I erroneously assumed that the men and women would be separated. Women would critique women and men would critique men kind of thing. I assumed incorrectly. Imagine my surprise to learn that my panel of advisors would consist of men named Bone, Nazareth and Thor. There was also Kenn and LeLand, the oddballs with normal names, but I digress. Bottom line, I’m a female humorist/story teller about to face an entire audience of comics and male critiquers with a story about the time my husband’s doctor guilted me into being present during his vasectomy. As for my bladder issues, I just moved around a lot hoping it would stablize. If that failed, I’m over weight so I was just going to tell the guys that I’m pregnant and my water broke. They are men. They would have dropped me off at the nearest hospital and gone on their merry way and I would have hidden out in my hotel room until the conference was over and my room mate was ready to drive home. Deana O’Hara is presently living with her husband of 19 years and two teenage boys in Broken Arrow, OK. She can be found perfecting her craft at any and every open mic night throughout Oklahoma as well as at a Target Store near you. While Deana no longer “loans” her jokes and stories for free, she will be performing this Friday night with Tulsa comedienne Michele VanDusen. Headlining the night will be funny man Dan McGowan from Denver. You can call the Our Savior “box” office at 836-3752 for ticket information. When all you know is a single story, about yourself, about your neighbor, about the world, a dangerous thing can happen. I’ve never heard of this young author. She is an amazing woman. This speach leaves me spellbound!